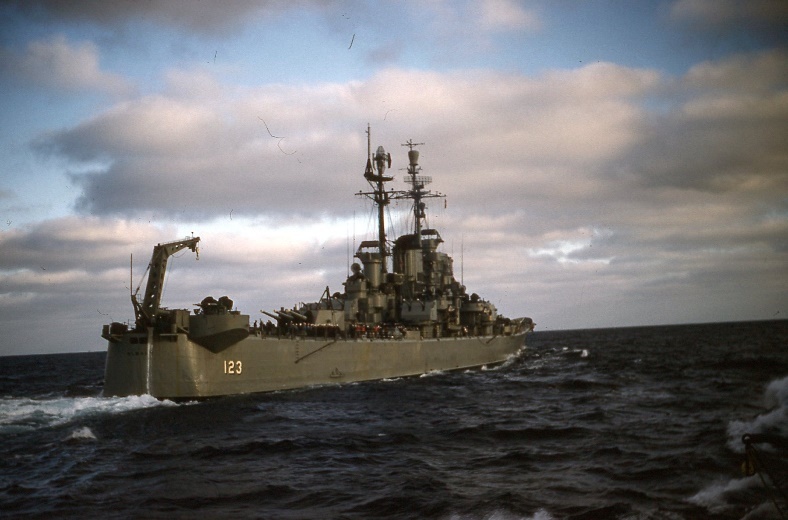 The fourth ALBANY, now a guided missile cruiser, was built as a heavy cruiser, CA 123, by the Bethlehem Steel Company of Quincy, Massachusetts. Her keel was laid on March 6, 1944 and she was launched on June 10, 1945 under the sponsorship of Mrs. Elizabeth F. Pinckney of Albany, New York, whose son was a prisoner-of-war in Germany. The ship was “bought” by the citizens of Albany through their subscriptions of over $40,000,000 in United States War Bonds. 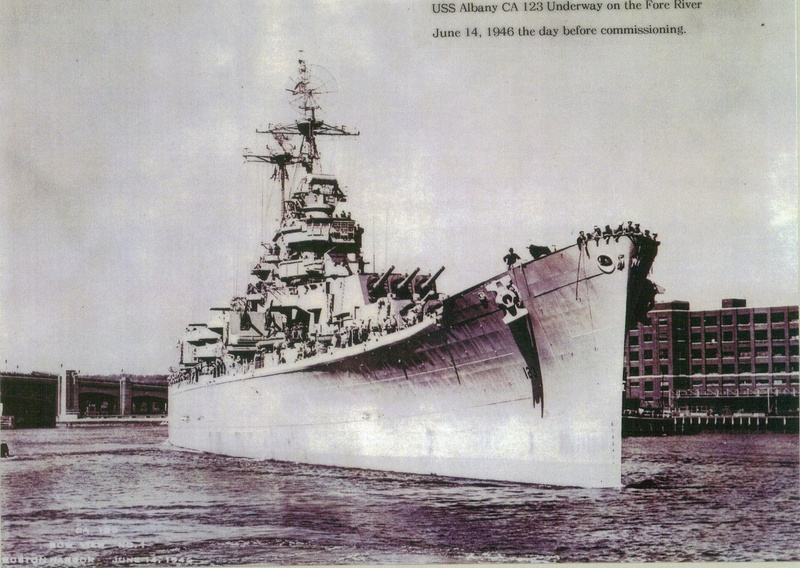 ALBANY was placed in commission at the Boston Navy Yard on June 15, 1946 under the command of Captain H. A. Carlisle, USN. After conducting trial runs off Provincetown, Massachusetts, shakedown training operations while based at Casco Bay, Maine, and returning to Boston for alterations, she arrived in her home port of Norfolk on January 21, 1947. During the next year and a half, she made several Midshipman training cruises and engaged in routine exercises which took her to ports along the Atlantic coast from Newfoundland to Argentina. On September 11, 1948, ALBANY sailed from Norfolk for a seven- month tour of duty in the Mediterranean area as flagship of Vice Admiral Forrest P. Sherman, Commander Sixth Fleet. In Vice Admiral Sherman’s farewell speech to the crew of ALBANY prior to transferring his flag to USS FARGO, he commended the crew on the excellent work they had done and named ALBANY the smartest ship in the Mediterranean. 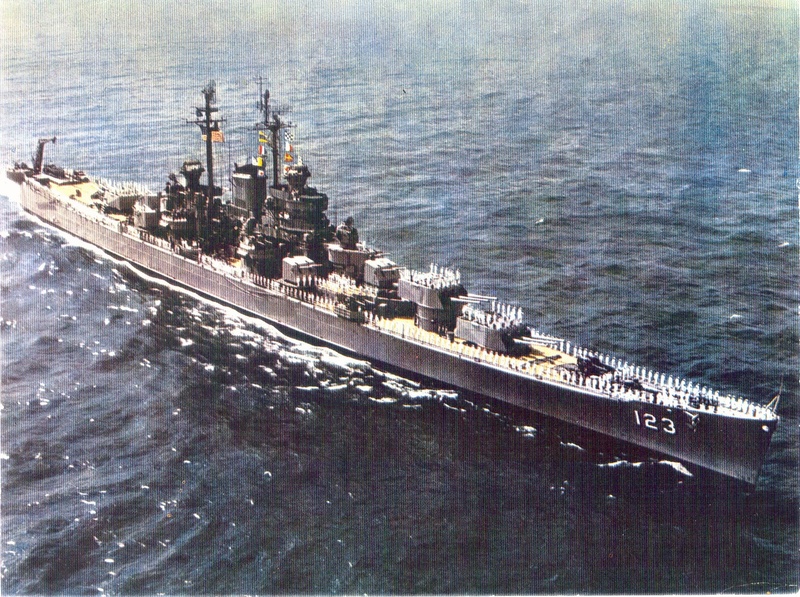 Returning to Norfolk on April 2, 1949 for overhaul in the Norfolk Shipyard and maneuvers at Guantanamo Bay, she became the flagship of Cruiser Division Two on June when Rear Admiral Richard F. Cruzan broke his flag. 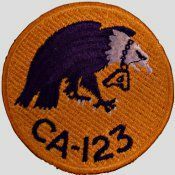 Several Training cruise’ along the east coast, Second Fleet Arctic operations in the Davis Straits, and refresher training at Guantanamo Bay during which the ship served as flagship of Rear Admiral James L. Holloway, Jr., Commander Cruisers, U. S. Atlantic Fleet, took place in the following months. on September 9, 1950, ALBANY left Norfolk for her second tour with the Sixth Fleet in the Mediterranean, still flying the flag of Rear Admiral Holloway. After maneuvers and visits to the principal ports of Italy, Sicily, France, Greece and Turkey, she departed Gibraltar on January 10, 1951, returning to Norfolk on February 16 by way of Rio de Janeiro where Admiral Holloway participated in the inauguration of the new president of Brazil. 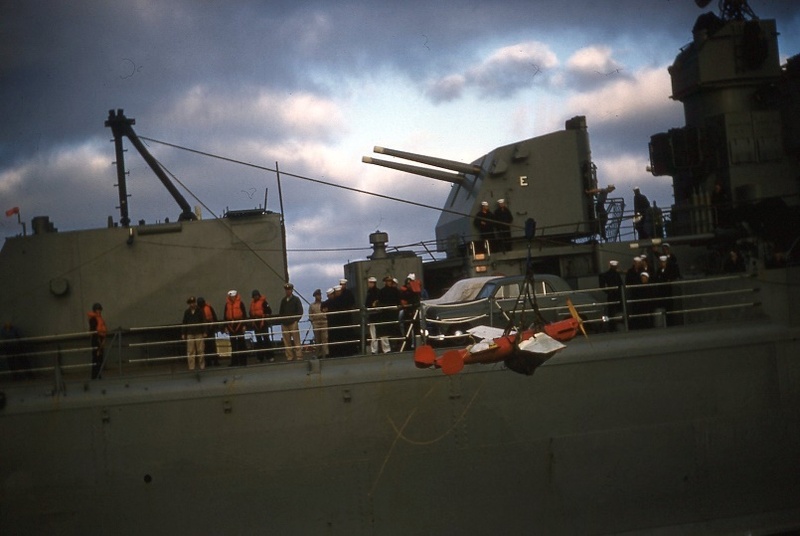 Vice Admiral Felix B. Stump, Commander Second Fleet, shifted his flag to ALBANY on August 27,1951 after the ship returned from a short cruise in northern European waters and calls at Copenhagen and Rotterdam. The ship departed for her third cruise in the Mediterranean in September; after returning to Norfolk in late December of 1951, ALBANY again became the flagship of Commander Cruisers, U. S. Atlantic Fleet and made several short cruises along the east coast. Rear Admiral E. T. Wooldridge relieved Rear Admiral Holloway as Commander, Battleship-Cruiser Force on board ALBANY on January 27, 1953. Still flying the flag of Rear Admiral Wooldridge, the ship departed Norfolk on January 5, 1954 for her fourth tour in the Mediterranean. 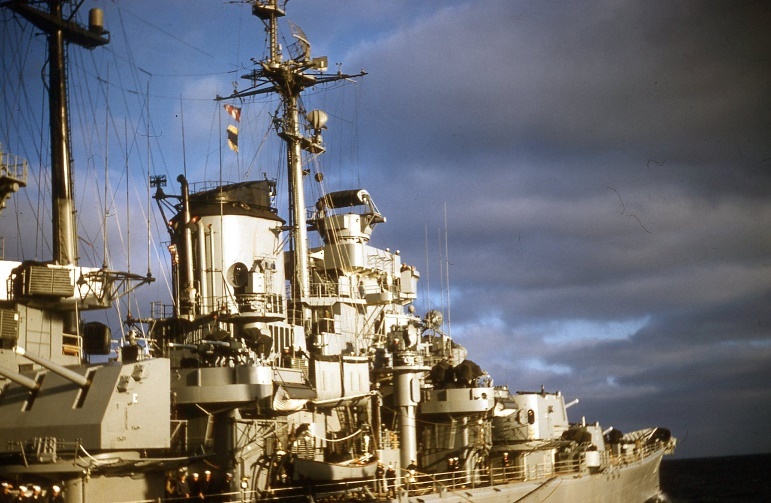 She returned to her home port on April 16, and after a six-month overhaul in the Norfolk shipyard, left for her fifth deployment with the Sixth Fleet on January 5, 1955, during which she made port calls as far east as Beirut, Lebanon. Arriving back in Norfolk on May 27, the ship’s subsequent operations included Midshipman Cruise Baker to Northern Europe. The ship departed from Norfolk on July 10, visited Stockholm, Sweden and Oslo, Norway, and returned to Norfolk via Guantanamo Bay, where she engaged in gunnery exercises. The three hundred thirty midshipmen disembarked on September 2 upon arrival in Norfolk. 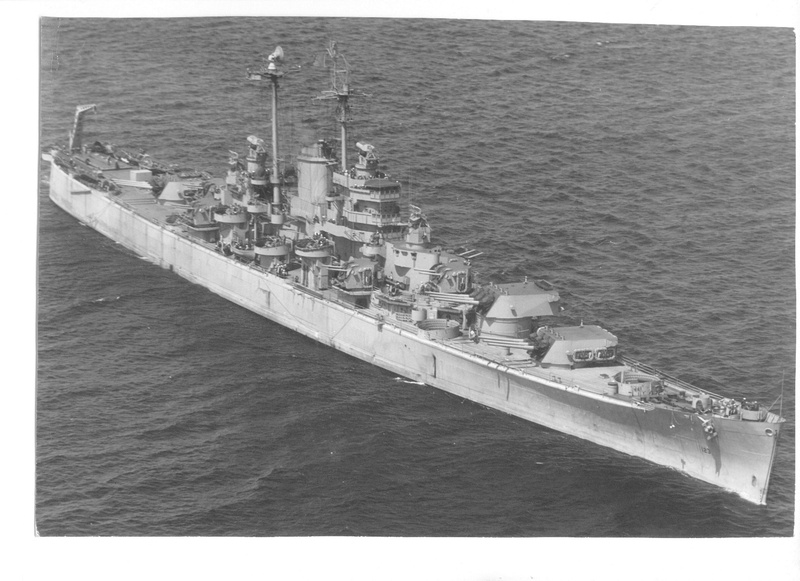 The flagship of Rear Admiral E. R. McLean, Commander Cruiser Division Two, ALBANY departed Norfolk again on January 4, 1956 for her sixth deployment to the Mediterranean. Port calls on this tour included Barcelona, Spain, Haifa, Israel, and Rhodes, Greece, from which the ship departed on May 16, returning home on May 29. A Midshipmen’s cruise to Valencia, Spain and Dublin, Ireland, a five-month overhaul at the Boston Navy Yard, a Reserve Midshipmen’s cruise to Valparaiso, Chile, the North Atlantic Treaty Organization’s ‘Operation Strikeback off the coast of Scotland, and the ship’s seventh Mediterranean cruise occupied the next eighteen months. Upon her return from the Mediterranean on February 28, 1958 ALBANY entered the Boston Naval Shipyard for inactivation. 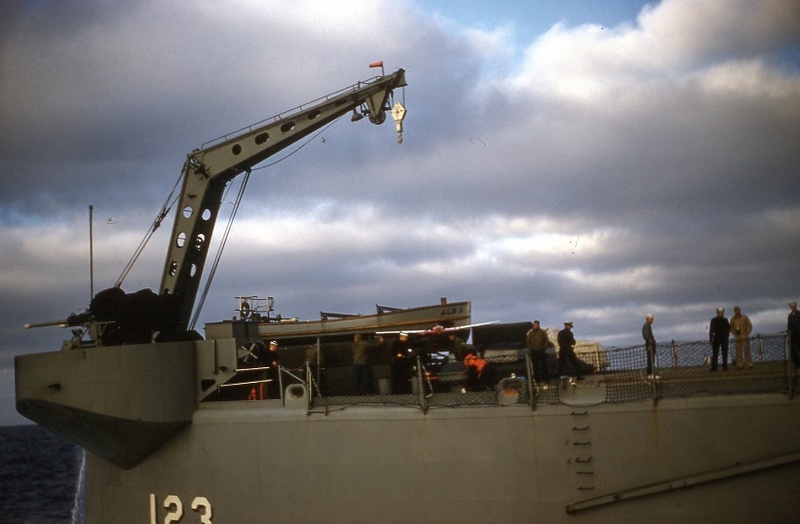 She was placed out of commission or June 30 and transferred to the custody of Commander, Boston Naval Shipyard, for conversion to a guided missile cruiser. 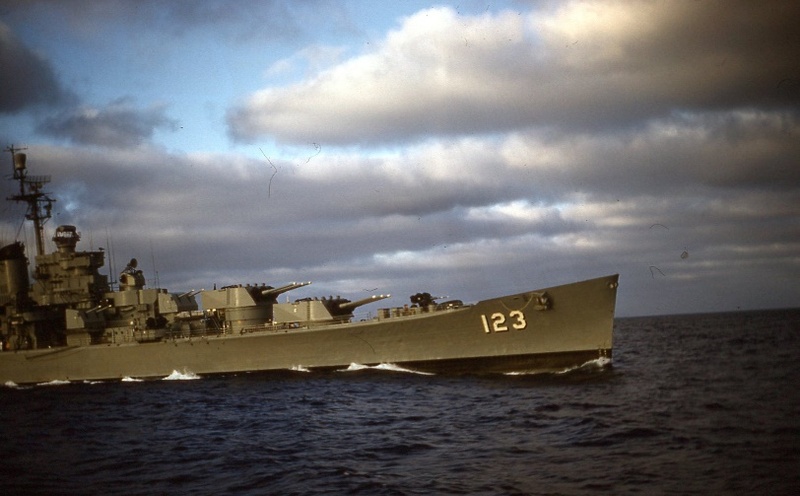 Her hull classification and number were changed to CG 10, effective November l, 1958. Over four years, 66 million man-hours, and a projected cost of $ 170 Million dollar resulted in a new ALBANY, the first of three ships of her class and the first ship in the world to undergo complete conversion from conventional gunnery to guided missiles. Her gun cruiser armament of nine 8-inch/55 caliber guns, twelve 5 inch/38 caliber guns, and thirty-three smaller anti-aircraft weapons were removed as she was stripped to the main deck and rebuilt. The results included two distinctive mast/ stacks towering 193 feet above the sea, a 90-foot high superstructure, and her extremely powerful new armament: TALOS anti-aircraft missiles. with a range in excess of 65 miles, forward and aft; TARTAR anti-aircraft missiles with a range in excess of ten miles, port and starboard and ASROC. 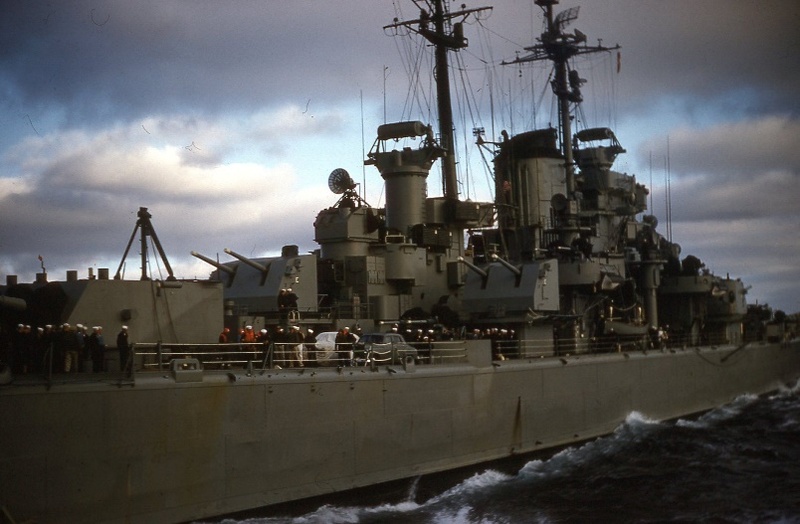 In addition to the complete conversion she was decommissioned again on 1 February 1967 thru 20 April 1969 for a complete Modernization upgrade at an additional cost of $ 21.5 Million dollars. ALBANY’s plaque bears the flaming sword, signifying protection, strength and sacrifice. The millets, or stars, are, in heraldry, the knight’s spur rowels, symbols of military power. There are four stars because the present ship is the fourth ALBANY. 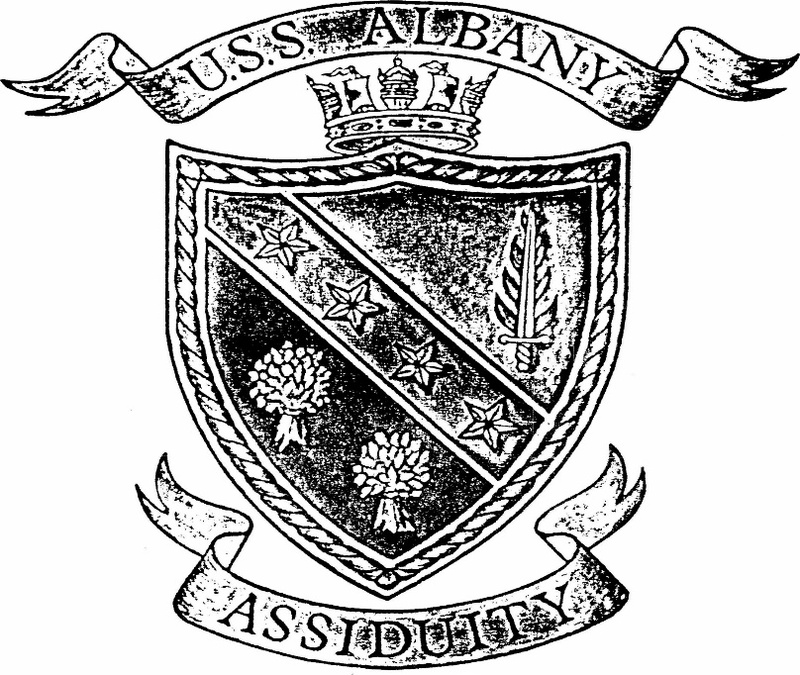 The garbs, or wheat sheaves, are from the arms of the ship’s namesake city, Albany, New York. The rope border and naval coronet, traditional in naval heraldry, symbolize sea power.